The Permian Period is the final period of the Paleozoic Era. It began about 290 million years ago and lasted until 248 million years ago. The greatest mass extinction that has ever occurred on earth took place at the end of this 42-million-year period. Its name comes from a region of west-central Russia called Perm Oblast. This is where rocks from this time were first found. 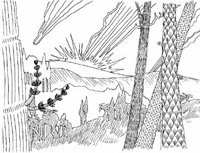 For most of the Permian, life on Earth was much like it had been in the Carboniferous. Temperatures were cooler because the continent of Pangea was moving northward. Mountains were forming as the supercontinent Pangea moved. When the continent of Siberia collided into the northern part of Euramerica, Pangea was complete. The Ural Mountains were pushed up by this collision. Pangea was shaped like a large “C.” It surrounded the Tethys Sea. The rest of the Earth was covered by a huge ocean named Panthalassa. Even though the ocean covered much of the earth, Pangea was so large that the interior did not benefit from the ocean waters. Deserts were places in the center of Pangea where the temperatures changed from very cold to very hot. In some places there was rarely or never any rain. 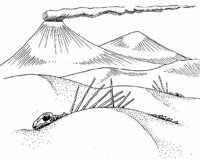 Over all the earth was dry during the Permian Period. The swamp land dried up and many of the plants that needed the water died out. New plants developed that were adapted to the dryer conditions. They were called gymnosperms. These plants had seeds. One of the earliest of these plants still exists today. It is called the Ginkgo. Most of the trees living during this time period were conifers. Conifers are trees with seeds in cones. The changing climate affected how animals were evolving also. Amphibians that had depended on the swamps for a moist habitat began to die out. They were replaced by the reptiles whose bodies could live in the very dry air and the wide changes in temperature. Pelycosaurs evolved from their beginnings in the Carboniferous. These animals look like a reptile, but have skull characteristics that make them more like a mammal. The most famous of the pelycosaurs is the Dimetrodon. Like many other pelycosaurs, Dimetrodon had a large sail on its back. The sail could have been used to help keep the body temperature stable. Therapsids developed during the Permian Period also. These animals are the ancestors of mammals and share some bone structure characteristics. 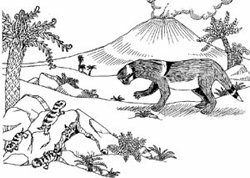 Some of the therapsids from the Permian period may have had fur to help them adapt to the temperature changes. The corals began to produce again in the Permian Period. After near-extinction at the end of the Devonian period, corals were now making huge reefs. Many corals did not survive the mass extinction that came with the end of the Permian. The horn corals and tabulate corals that had built many reefs in the Devonian period were all gone after the Permian. The corals were not the only species to become extinct. The Permian Extinction was largest mass extinction that had ever occurred. No extinction since has killed so much of the life on the planet. In the seas, 90 to 95 percent of the species went extinct or were severely harmed. On land the damage was less severe, but some species, like the pelycosuars, died out completely. There are many theories about the cause of this great extinction. It could have been caused by huge amounts of volcanic activity, more than any that has been experienced since written history. We know from recent volcano eruptions that large eruptions can cause the temperature to drop all around the globe. Another theory is that a comet or meteor could have hit the planet, setting off a series of events that would have caused changes to temperature and sea levels, including the formation of glaciers. Others think that the formation of a land mass as huge as Pangea upset the balance of climate that happens when the ocean waters can affect more of the land surface. No matter what the cause, the extinction event that took place at the end of the Permian Period was so important that it brought the end to the Paleozoic Era. Life on Earth would never again look as it had during the Paleozoic Era.